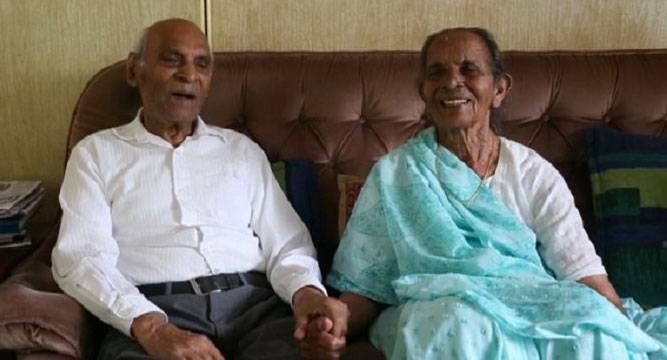 Married for nearly 81 years, an Indian-origin couple, both aged 99 who have taken part in India’s freedom struggle, have been awarded New Zealand’s longest- married couple by a group, media reports said today. Auckland couple Jeram Ravji and Ganga Ravji, who will turn 100 in May and June respectively, will be celebrating their 81st wedding anniversary in two months. Jeram and Ganga were born in India on May 4, 1916 and June 6, 1916 respectively. The couple, whose family includes six children, 15 grandchildren and 25 great-grandchildren all living in Auckland, were betrothed at the age of six in India and married at the age of 19. They were felicitated by Family First NZ, a Christian lobby group. Ganga said her husband was imprisoned for 10 months after joining Mahatma Gandhi’s freedom struggle and fighting against the rule of the British government, NZ Herald reported. She was often beaten up by police during her husband’s time as a freedom fighter to try to get information from her about her husband, she said. Ganga said that the key to a good marriage was to learn to make sacrifices and to take the good with the bad. “(The advice) we would give to our children if they had difficulties with their marriage would be you have to work hard, you have to have tolerance - that’s the most important part, tolerance,” Ganga said while speaking to the Herald through her daughter Bhanu Daji. The Ravjis said they love each other just as much now as they always have. He moved to New Zealand in 1928 when he was 11, five years after the pair became betrothed at age six in 1922. They married at 19 and lived as a family in New Zealand from 1953, first in Whanganui before moving to Auckland in 1981. “Although we can only go on the nominations made, we are pretty sure that the Ravjis are New Zealand’s longest-married couple. As part of their award from Family First NZ, they will have a professional photo sitting with their extended family which includes 6 children, 15 grandchildren and 25 great-grandchildren all living in Auckland. “The last family photo was 10 years ago at their 90th birthday celebrations,” Family First New Zealand Director Bob McCoskrie said. Despite fighting the British rule in India, Ravjis said they were looking forward to receiving their letter from the Queen when they turn 100 this year.